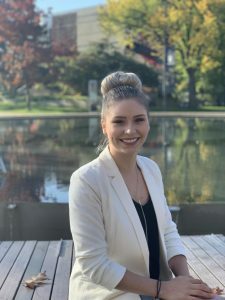 Chantal Despres is a current third-year, dual-degree student with a passion for commerce and the law. Having completed her first two years in France at Sciences Po Paris, Chantal comes with leadership experience and a unique perspective because of her international studies, both of which she is eager to share with the Sauder community. 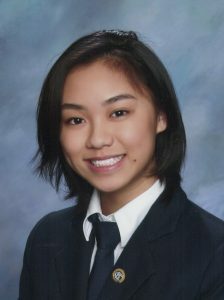 She recognises the diversity of the Sauder student population and believes she will be an excellent Ombudsperson. Continue to advocate for the mental health of Sauder students. Open the doors for students of all years to voice their opinions and concerns in a safe, unbiased environment. And to serve the Sauder student body to the best of her ability by being approachable and available. 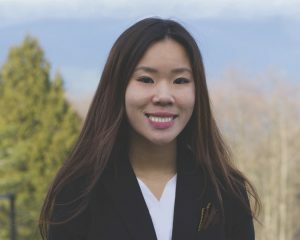 To fulfill these goals, Chantal is committed to holding weekly office hours, attending monthly meetings, and representing the voice of students with the aim of bringing real, positive change to the Sauder community. Hello! I am a first year student currently involved with Sauder’s Health and Wellness. You might recognize me as the girl that served you pasta at a recent HeWe Eats! From being part of HeWe, I have solidified my passion and proven my dedication to help my fellow students have a positive university experience. I would love to further my passion by running to be your CUS Ombudsperson as it is a position that will allow me to ensure transparency around the CUS, build trust within the community and give fair representation for all parties. Upholding the code and ensuring that operations within the CUS are true to its values will provide students the transparency they deserve. Further, I promise to keep OmBlogs up to date with relevant information so you won’t miss a thing! I will be here to answer any questions about the CUS. Establishing trust within the community is crucial when it comes to making sure everyone’s voice is heard. I hope to gain your trust and enable you to feel comfortable expressing your thoughts and concerns. You can rely on me to maintain a just environment that includes your voice. The process of working in a team inevitably comes with internal disputes. As much as I will represent students outside of the CUS, I will also help resolve conflicts from within. My goal is to act as an impartial third-party for everyone to confide in. Hi everyone! My name is Matina Pun. I am a first year student and I am running to be your CUS Ombudsperson for the 2019-2020 academic year. Aside from being a neutral voice in board and executive meetings, one of the things that I would like to focus on as Ombudsperson is to increase awareness of this resource for the Sauder community. As the Ombudsperson, I would be a liaison to bring questions or complaints from student to the CUS and its organizations. By bringing specific concerns to the table on behalf of students, I can ensure serious issues are considered while putting students at ease. I have always been passionate about helping people with their concerns, and I am willing to go the extra mile to create the safe space where we can make sure that everyone is heard. One of the challenges that I especially like about this is to open up channels of communication. To me this means creating transparency between the CUS and the student body, so that the CUS, and by extension myself are as approachable as possible. This means that I’d love to meet up or go for coffee! This way, I can bring enriched feedback to the CUS to make a better community.